To supervisor and control all installation BTS/NodeB subcontractor to meet to quality of installation and be on time. Continuous daily coaching and training of system technicians to ensure that progress is made and ensure system progress as a whole. Maintain current knowledge of any and all technical aspects of the cable industry. Minimize trouble calls after installation and meet weekly installation goals. Maintain and enforce company, federal and state rules and regulations, such as non-discriminatory practices, payroll and overtime guidelines, etc. Ensure work/escalated issues are addressed and completed in a timely manner and that all delays and revised timeframes are communicated to affected parties. Performs any other management requests or directives as they relate to the overall function of Company policy. Enforce all safety codes, (federal, state and Company) including employee awareness, training, reporting, and correction. Work to reduce unnecessary and inefficient work. 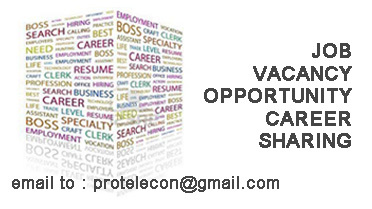 Bachelor degree or above with telecommunication background. Experience in Node B roll out both technical and subcontractor management. Fluent in English in a must, fluent in mandarin will be an added advantage.